With 3CX Recording Manager you can easily manage (search, play, download, archive, compress, delete, purge, export, score, and add notes) your call recordings using a simple web portal. Our design goals for 3CX Recording Manager, are (1) make it simple to find the recording you want fast, (2) reduce your long-term disk storage demands through archiving, and (3) help ensure quality customer service through agent reviews / scoring. Discover how much better recordings management can be! Need to keep recordings for regulatory compliance? Use the archive function to keep a permanent record. Recordings can take up a ton of disk space. We can compress your recordings to require 1/2 the original space without audio degradation. Need a compatible recording format for your Android device? We can email and archive in MP3 format. Managers can access recordings based on 3CX Extension Group membership. Access recordings from a simple web portal, rather than the 3CX management console. Individuals can only see their personal recordings. Managers can review recordings made by their team members. Compress your recordings to 1/2 the original size without audio degradation. Implement a retention police to delete old recordings. Archive recordings for mandated retention. Remove the ability to delete archived recordings. Our good friends at Electronic Frontier Ltd (EFL) have created an informational video to showcase the features and user interface of 3CX Recording Manager. EFL is the premiere 3CX distributor in the UK. Special thanks to Eddie for taking the time to create the video! With 3CX you can record phone conversations. You can record individual calls on an ad-hoc basis, record all calls made by a specific extension(s), or record all calls on the entire phone system. But once you have saved all these recordings, it’s not easy to find the one you want. If you are working with a big call center, you could be dealing with literally millions of recordings. How are you going to find the right recording? One of the very real challenges facing organization that are legally mandated to save recordings (sometimes up to 10 years) is managing disk space. With thousands, or even millions of recordings, the disk space requirements become unmanageable. With 3CX Recording Manager, you can optionally archive 3CX Recordings as MP3 files to an alternate location (on a Network Attached Storage (NAS) device for example), or to an alternate email address. MP3 files require a significantly less space compared to WAV files (approximately 1/2 the original size). Providing an automated method of reducing the file size, and making an archive copy of the recording to an alternate location, will help reduce storage requirements and ensure a permanent copy of the recording is saved. The retention policy will automatically delete old recordings that are older than the specified date. You can even listen to recordings (current or archive) directly within the web portal, and email a copy right from the portal too. If you are running 3CX in a hosted environment the server time may not match your local time. The 3CX Recording Manager web portal gives you the ability to select a display time zone so you see the recording dates based on your desired time zone. Finally, if 3CX Recording Manager is configured to email copies of recording, the file attachments are also in MP3 format which will help minimize the attachment size, and the storage required on your mail server. Our tool provides a web portal with a searchable database. You can easily find all the calls made by any extension in the time frame and on the date in question. You don’t have to try to search a folder on some distant server, and try to decipher an ugly file name to find the right recording. And you don’t have to give users rights on your 3CX server console. The web portal has a built-in query manager that makes it easy to build simple or complex queries. From the portal, you can click on the recording icon to listen to a recording. You can save the recording to your computer, or you can email the recording to anyone you like. You can delete the recording right from the web page (if you have the necessary permissions). As a manager of a 3CX Extension group you can review recordings made by your staff. Agents can only review their own recordings. In addition, you can have recordings automatically emailed to you when you have finished recording the conversation, and optionally have the recording deleted from the server after successfully emailing the recording. Managers can score how well the agent handled the call, and annotate the recording with notes. These notes can then be reviewed by the agent. It’s a great tool for improving customer service. There is also an automated retention policy that an administrator can setup. The retention policy looks at the age of the recording and, on a scheduled basis, if the recording is older than the specified number of days, can delete the recording. Archived recordings are not deleted. Access to the web portal is controlled using your existing extension number (serving as your username) and voicemail PIN number (serving as your password). This means there is no need to maintain a separate user login database. You simply use the existing security built into 3CX, leveraging the username and password you already know. Because this is a web portal, nothing needs to be installed on the agent’s computer. You can access the portal from anywhere using your PC, MAC, or Smart Phone. Updates to the application are performed on the server and are immediately available to all users simultaneously. Managers have the ability to control which extensions have all their calls recorded right from the web portal. This makes it easy to update extensions in 3CX without having to give administrative access to the 3CX Management Console. You control who has the ability to delete recordings from the portal, and all portal access/activity is logged. 3CX Recording Manager utilizes Microsoft Internet Information Server (IIS) as the web server, and Microsoft SQL Express as the database server. Both products are free from Microsoft, so the only thing you need to purchase is the license key for 3CX Recording Manager. 3CX Recording Manager makes everything EASY! 3CX does a great job recording calls. 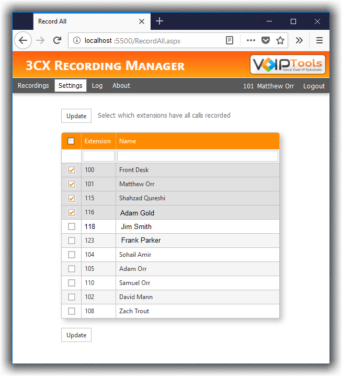 With 3CX Recording Manager now it’s easy to manage these recordings. 3CX Recording Manager can be installed either directly on the 3CX server, or on a remote server. Installing on a remote server requires installation of the 3CX Relay Agent on the 3CX Server, but the Windows service, SQL Server, and web portal can all be installed on separate servers. Note 3CX changed how recording dates are saved. Previously dates were saved using the server’s time. In 12.5 recordings are now saved as UTC. If you need to correct any of the recording dates in the web portal, open the 3CX Recording Manager configuration program and select “Import” from the SQL tab. The import program will update the date of all recordings that exist on the server and add any recordings not currently listed in the portal. Can I install Recording Manager on the 3CX server? 3CX prefers that nothing be installed directly on the 3CX server other than 3CX. This includes anti-virus, SQL Server, etc. This greatly simplifies the environment they have to support, and may improve reliability. While technically required, we recommend you install 3CX Recording Manager on a separate virtual machine or physical server. Let's keep 3CX happy!